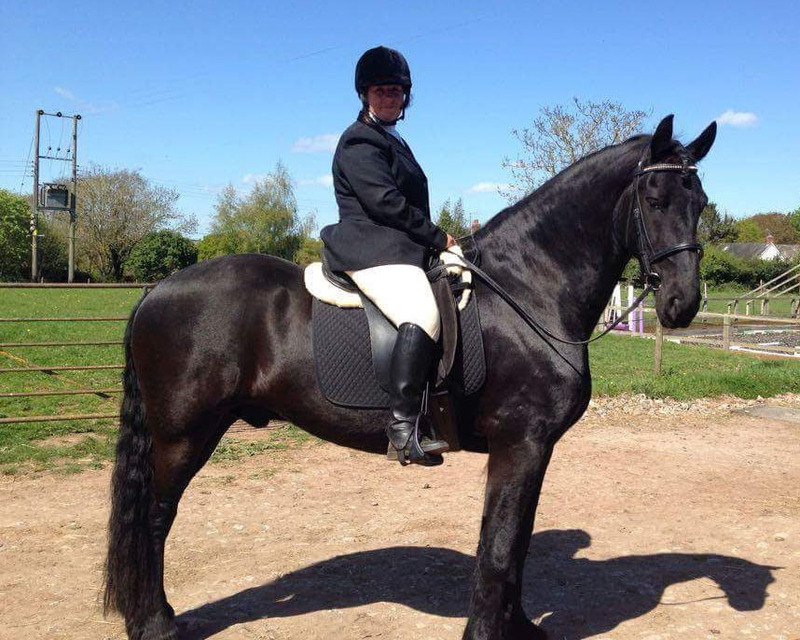 I have ridden horses for over forty years and have owned Friesians for the last ten years. I have been a professional groom in many equestrian disciplines and have been a professional riding instructor in the UK and Europe. For more than 20 years I have been a show judge, from grass roots to County level in the UK and Europe. I have extensive experience and knowledge of working with the KFPS and their policies and procedures and I am currently an elected member of the Member Council of the KFPS, the first and only UK person to do this. 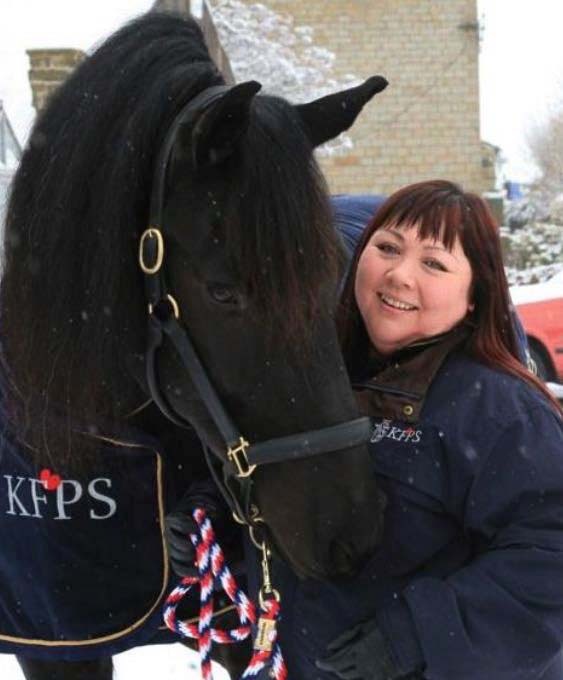 I have successfully completed levels 1, 2, 3 and 4 in KFPS Friesian judging in the Netherlands and, at the present time, am the only person in the UK to have been awarded level 4. Having had horses all my life, I had always dreamed of having a Friesian but thought it was out of my reach. 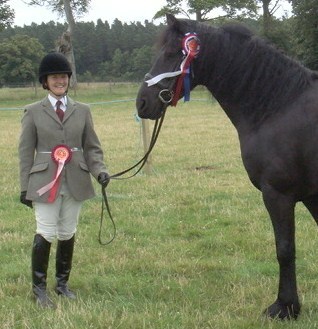 In 2011, I started looking for a new horse and had many unsuccessful viewings of other breeds. My Husband was now frustrated on my behalf and asked me if I could have any horse, what would it be? Well of course my answer was a Friesian filly and that's how our Friesian family started with many trips to Friesland we now have four. A 14 year old Sport gelding, Jelle, who we compete at medium, advanced medium dressage. A 5 year olf mare, Okki, whom we are competing at novice dressage. A 3 year old stallion, Tygo, who will attend the young stallion test this year. And Braka, our yearling filly whom recently received a 2nd premie. All our Friesians were imported from Friesland. I have been involved with Friesians for 15 years and currently have 16 Friesians at home and 1 Stallion over in Holland for training. I have bred to the expectations of the KFPS which has enabled me to breed quality foals taking UK Foal Champions most years, along with various Reserve Day Champions and Overall Day Champion. I have bred ster quality Mares and Stallions and have produced a Preferent Mare from my off spring. I have spent a lot of time in Holland going to nearly every Keuring at least once. I have learnt everything from the Dutch, which has enabled me to bring this knowledge back to the UK and improve my own Friesian bloodlines. I currently have youngstock, riding, driving and brood mares. I've been around horses since the age of four, however I finally came to own my first horse when I reached my late twenties. I completed a higher national certificate in equine studies in 2000 at Writtle College and had the opportunity to run two small livery yards in Essex before moving back to the Midlands. My first horse Norman was with me for 16 years before I lost him at nearly 24. Just before I lost Norman I'd started to search for for my next forever horse and had always watched in awe and dreamt of owning one of these gorgeous, black, majestic black pearls or as we know them the Friesian horse. In 2015, I went to Holland to look for and buy my first Friesian and I feel honoured to have found such a loving, willing, forward and friendly horse, Minno (Andries x Dries). I spent the first three months letting Minno settle in and allowing him to get use to his new country surroundings and me. The first year consisted mainly of hacking with some light schooling and from August 2016 onwards, we had many many great experiences such as the Friesian Festival, riding in the Drill Team performing at The Warrington Show and representing the Friesian breed at The Horse of the Year Show 2017. 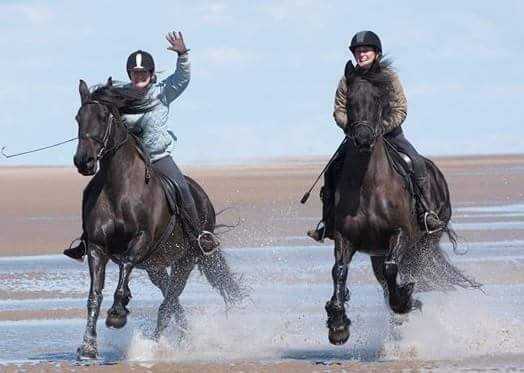 We have lots of fun times too such as beach riding, fun rides, horse holidays and courses and having him lightly trained to carriage driving. I plan to continue having fun with Minno, ride in the Drill Team and try our hand at dressage too. I have met some amazing people whilst being a member of FHAGBI and now as a committee member I look forward to helping others learn and mostly have fun with this magnificent breed. I was lucky to get my first pony when I was 12 years old. A Fell pony. I also had the horse magazine which had a picture of a certain breed each week. I will never forget opening the page to see a friesian and thinking how much I would love to own one one day. Many years later and a few ponies and horses, a friend called me to advise me of someone selling quite a few. My intentions was to buy a young filly, however on my arrival for viewing, the lady only had Colts or brood mares left. So Bertha, as we call her, was my choice. Due to the extra cost, I knew that I would have to let go of the foal but Bertha really was worth her weight. Not being disrespectful to Bertha, but that is quite heavy. The foal, a beautiful filly which I named Beauty was sold at weaning. 18 months later I was asked to take her back and felt obliged to do so. A long story with her but she never ceases to amaze me. Together we have been successful at showing with Bertha, done a little dressage and both horses are on our amazing drill team. We enjoy hacking out mainly. I have had Bertha now for 11 years next spring, now 16 years old and beauty is a 10 year old going on 3 depending on her mood. I love my girls dearly along with our small Shetland stud. Can't imagine life without them. Growing up I was a typical pony-mad kid and was 13 when I got my first horse, Joey, a TB x Connemara. We did everything together, hacking, show-jumping, cross-country, fun rides. He has been my horse of a lifetime and after 27 years together, he is still going in his thirtieth year, albeit much greyer and slower! About 15 years ago, I went to a local driving show where I saw a yellow coach being driven by four, dashing Friesians. I was absolutely gob-smacked at the sight of these majestic horses trotting around the ring. I instantly fell in love and knew I had to find out more. I did alot of research on the breed in the years that followed and the more I read, the more I fell in love. I vowed that one day I would have one of my own. Fast-forward to 3 years ago and due to a heart condition, I had to retire Joey, so I began looking for a new horse. A Friesian! As luck had it, I saw a beautiful 18 month old colt advertised by one of my favourite approved stallions, Norbert 444 and he was exactly what I had been looking for. And so I became a proud Friesian owner. Argento is now 5 years old and I still have to pinch myself every time I see him in the field that he's actually mine. He is so intelligent, kind, goofy, brilliant around my two young daughters and is an absolute delight to own. Argento lives at home with us and our four other horses and is an integral part of our family. FHAGBI has been a fountain of knowledge over the years and I am truly grateful to count myself amongst the lucky people able to live my "Friesian fairytale". I live in Herefordshire and am a nurse at our local Hospice. I have always had a passion for horses and bought my first horse when I was 24. Since then I have only had one other for 21 years until he died. My first experience of Friesians was at the Birmingham NEC when there was a show of Lusitanos, Lipizzaners, Andalusians and Friesians. As soon as the Friesians came out I was completely hooked. I had never seen such beauty. I resolved that one day I would own one. 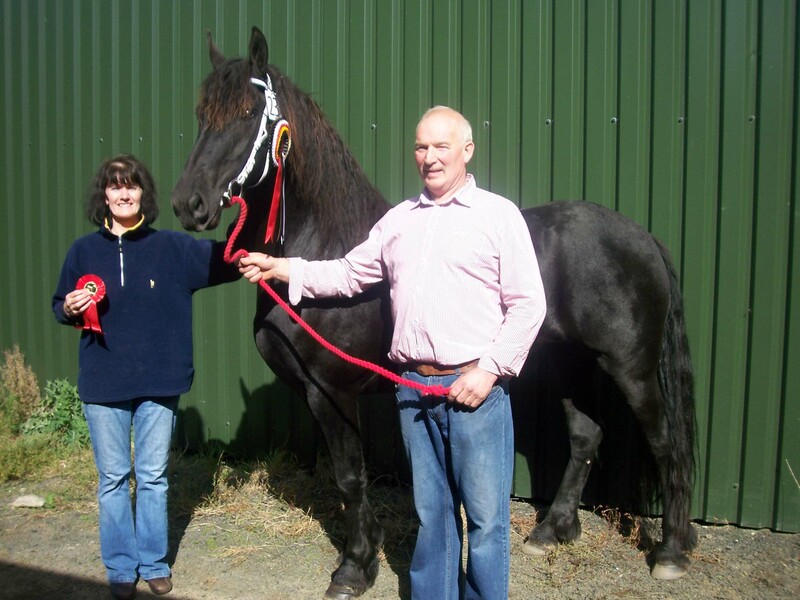 After many years I was able to achieve my dream and with a great deal of help and support within FHAGBI and the wider Friesian community, I achieved my dream and imported my truly amazing horse, Elco. I can honestly say that he is the gentlest, kindest horse I have ever known and every time I look at him he fills me with love and wonder. When I ride him people look at me with amazement, he makes me so proud. I was warned before I bought him that Friesians are addictive, I didn't believe it at the time but it is so true! 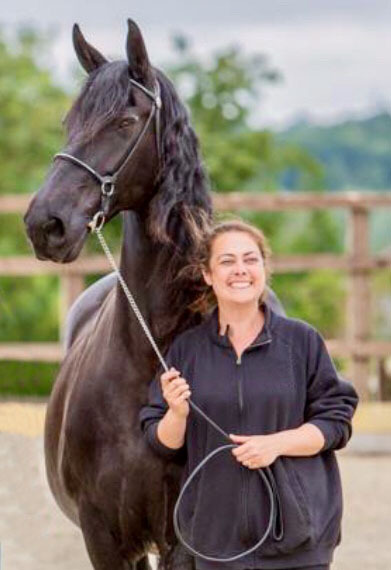 I have a real passion for the breed and want to see them increase in numbers in this country and for more people to feel the thrill and wonder of owning a registered Friesian. I've always loved horses, even as a little girl I would stop and stare over the top of gates at these beautiful creatures. It wasn't until I was a married woman that I got to own my first pony, with three children off my hands I could really start to enjoy riding with friends through the forest. I guess I was about 38 when on holiday in Germany I was being shown round a stud farm to ask about livery, and was being followed by this huge black horse, keeping her distance behind me, she slowly came near enough so I could feel her breath on the back of my neck. I asked the manager about her and he told me she was a Friesian. Well that was it for me love at first sight. On returning to England I made it my mission to find out as much as I could about this rare and most beautiful horse I'd ever seen. Not long after I bought my first mare through FHAGBI .She was 8 years old and I remember her owner saying to me, "You will drive her!" I thought, never, but I did she took to it like a duck to water. 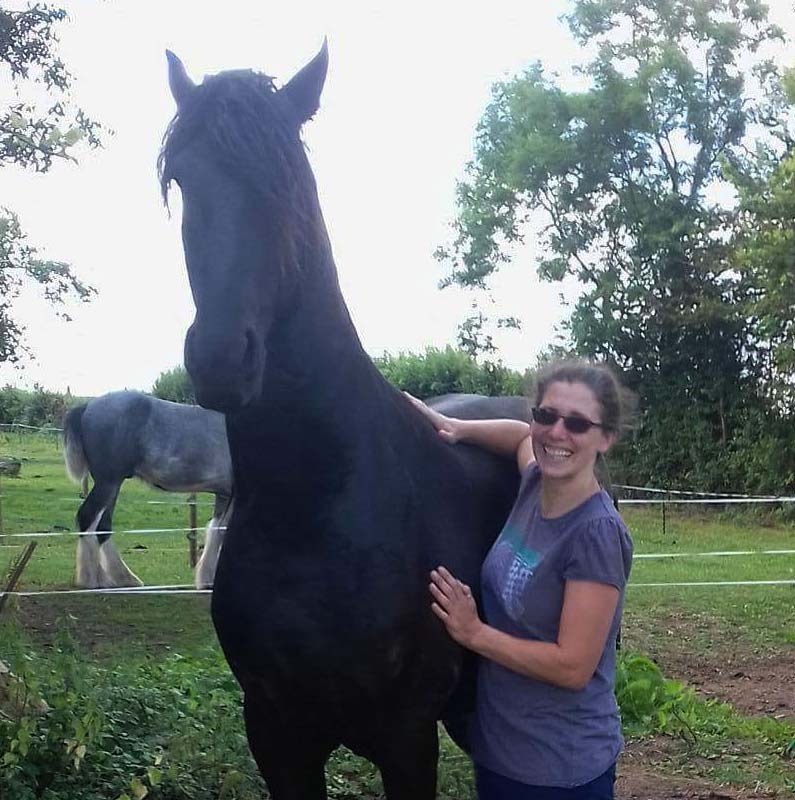 I took my girlie to France where I spent the next 10 years of my life and bought another Friesian this time a filly, which at the age of 3 graded "Ster". She had a filly who also got her "Ster" . My old mare passed in November at the age of 26 and I miss her. My mare I have now is so special, I rescued her whilst in France she is very tall and elegant. We had a filly with her, which like my other was sold on my return to England. My ambition now is to enjoy riding again as I used to, and maybe do an odd dressage test with her, I'll see how it goes. I'm so happy to be able to join the FHAGBI Committee and look forward to being part of the organisation of the events planned for 2019 and supporting the Directors. 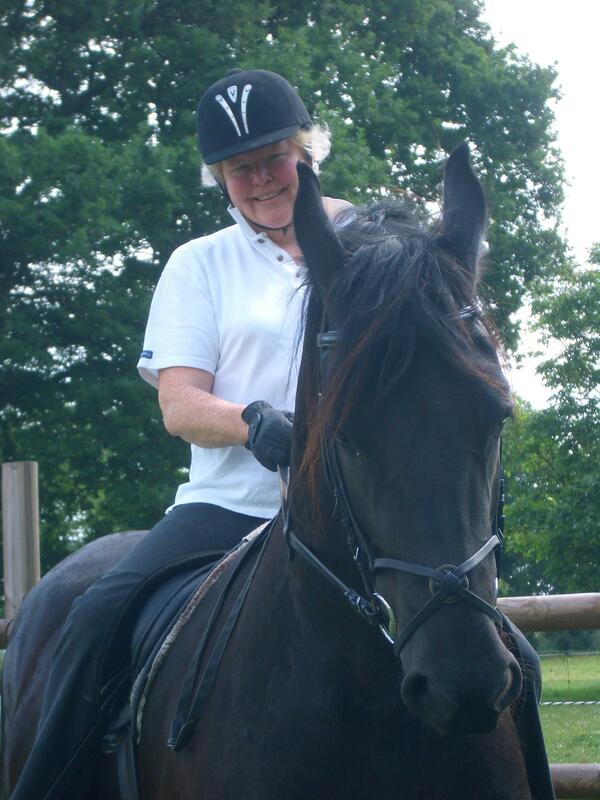 A bit about me - I bought my lovely Fresian Lady (by Maurus 441) knowing very little about the breed or the society. I only knew that I'd never seen a horse so beautiful and that was 4 years ago and I've never looked back. When I joined FHAGBI it was to enable me to update her passport. I could never has guessed that I was going to find a whole bunch of new friends have the chance to learn to drill ride and attend inspections. Now I have the opportunity to be helping behind the scenes with the people who make this all happen. I was born into a farming background and am the second eldest of 9 children. My father and mother had a mixed farm which gave me a good insight into breeding and rearing animals. After leaving school I served my apprenticeship in the building trade which I still run. I have 2 sons and Jonathan, my eldest is in the building business with me. My other son, Simon s a chartered surveyor. I ran a flock of 240 breeding Ewes and 20 suckler cows for a few years. I decided to increase our cows to 70 and stopped keeping sheep as I could manage the cows easier alongside our building business. In 2006 I had two spinal operations and had to sell the cows to reduce the workload. I had a Connemara mare which I bought for Jonathan. When he had outgrown it I took the mare to a Friesian stallion which a neighbour owned. She produced a bay colt foal which went on to be a Grade A jumper. This got me interested in Friesians when I saw the appearance and the intelligence this horse had. In 2007 I bought four Friesian Studbook mares in foal from farms in the Netherlands. Between buying and breeding we now have 11. My sons, Johnaton & Simon and my partner, Betty, are a tremendous help to me looking after these beautiful horses. My brother Mervyn also breeds Friesians and we intend to promote Friesian horses throughout Ireland and afar. I come from a family of 9 and was brought up on a mixed farm. My father worked with Clydesdale horses before the tractors came along. I have 3 sons and 1 daughter and I run my own ceramic wholesale business along with a garden centre and nursery. I became interested in Friesian horses was when I saw a half-bred Friesian that my brother, John had and I liked the look of it very much. It was from here that I decided to get myself a Friesian mare and I then brought 3 in from Holland and started to breed them myself with Studbook stallions. I now have a total of 13 Friesians. My aim is now to promote the Friesians in Ireland and afar as they are beautiful horses. I was the typical child desperate for a pony but coming from a totally 'unhorsey' background my pleas fell on deaf ears. Persistence pays off though and as a teenager I was given a totally unsuitable horse and left to get on with it and 'get on with it' I did, for 23 years with that particular horse. Many more years and a succession of horses later, I am still as hooked as ever. 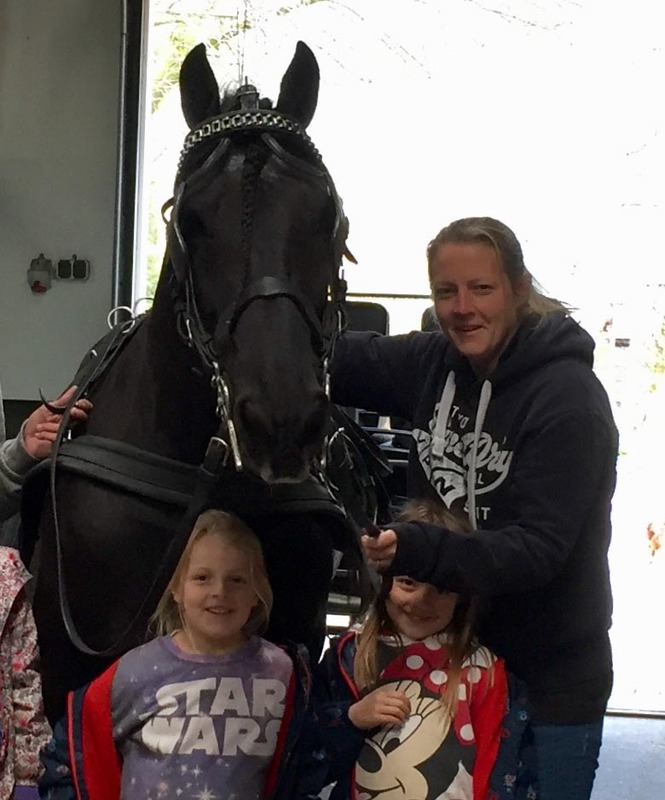 I realised fairly early on that horses would not provide me with a living and throughout my 30 year career in the police service, horses gave me an interest totally unconnected with my work. I am a firm believer that the best relationship between horse and rider is achieved when your finances are not completely dependant on it! My interest in dressage was mainly due to being unable to jump without falling off, however my dressage successes were modest to say the least. Although rosettes are nice, they were never the 'be all and end all' for me, which was just as well. I loved being around horses and that was enough for me. My retiral from full time work co-incided with a search for a new horse, hopefully to progress in dressage but more importantly to be an all round riding partner. I didn't want a horse that could only be ridden in a dressage arena or handled whilst wearing protective clothing. The Friesian appealed, not only because of its looks, paces and rideability but also because of its legendary good temperament. My introduction to the Friesian breed in 2005 could not have been bettered. The 3 year old gelding I bought turned out to be 'the stuff of dreams' and in every respect a typical Friesian. A steady and willing hack from the outset, he was as happy ambling along country lanes as he was in the dressage arena. 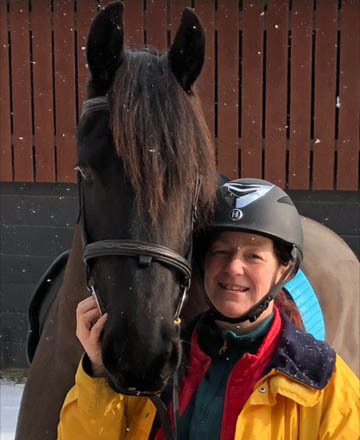 In his first year of affiliated dressage competition, as an 8 year old, he qualified for both Summer and Winter Regional Championships and was Scottish Preliminary Champion. He confounds critics who say that the Friesian is lazy and too high in its head carriage to truly work over its back, more suited to pulling a carriage than being ridden competitively. I hope to continue to prove them wrong. These are special horses and to be owned by one is an honour and a privilege. To those looking for instant success, look elsewhere, this is not a breed that can be hurried through its training. With its co-operative and forgiving nature, it can be very tempting to rush the basics but nothing is more important than to give this horse time to mature. Your care and patience will be repaid many fold, with a kindness and desire to please that I guarantee will astound you. I look forward to promoting this fabulous breed, not only in the dressage arena but through my association with FHAGBI.